The World Health Organisation (WHO) has identified ten threats to global health for 2019. In the light of growing concerns about the global increase in outbreaks of vaccine-preventable diseases, the organisation has included “vaccine hesitancy” on this list of health threats. The WHO defines vaccine hesitancy as “the reluctance or refusal to vaccinate despite the availability of vaccines” – adding that this trend threatens to reverse progress made in tackling vaccine-preventable diseases. We are interested in the reasons why people are opposed to or uncertain about vaccinations. In particular, we will look at the content and origins of ‘anti-vaccine’ messages on a number of Facebook groups focused on South African audiences. This research project will be based at the Centre for Research on Evaluation, Science and Technology (CREST) at Stellenbosch University, and will take place under the auspices of the SA Research Chair in Science Communication. The project will build on recent PhD research by Francois van Schalkwyk who looked at how Facebook groups contribute to anti-vaccine attitudes. With this research, we will conduct a more in-depth textual and visual analysis of these messages and their origins in order to understand the motivations that drive local (South African) anti-vaccine rhetoric on Facebook. Hannah Keal, communication manager at the Africa Health Research Institute and MPhil student at CREST will conduct the research, under my supervision. Earlier this week, Cape Times reporter Yolisa Tswanya interviewed me about this upcoming research project – read the interview. When considering the reasons why some parents avoid vaccinating their children, the WHO points out that there are several contributing factors, including complacency, difficulty in access and lack of availability of vaccines. We are particularly interested in how new media platforms (such as Facebook and Twitter) may be contributing to vaccine hesitancy. These new media tools provide an easy-to-use and virtually cost-free option for people who are opposed to vaccines to interact with like-minded individuals and groups, and also to persuade others. In these ‘altered’ environments, the traditional media gatekeepers such as journalists and news editors do not exist. Now, everyone can produce and share news and views, giving people more choices about the networks and platforms where they can find new information. But, it becomes very difficult for non-specialists to judge the quality and credibility of information and to decide who to trust. To complicate matters further, people are also influenced by the comments of others, and by the social cues (such as ‘likes’ and ‘shares’) that characterise social media platforms. Looking at the kind of information shared and discussed on so-called ‘anti-vaxxer’ platforms, scientists may feel that they could change people’s views if they could give them more information about the safety of vaccines. But, social science research has shown us that bombarding people with lots of ‘evidence’ will not necessarily change their minds. In fact, overloading people with facts about the diseases that could result if you don’t vaccinate may actually backfire, and make them even more resistant (see Study: You Can’t Change an Anti-Vaxxer’s Mind). Studies like these have shown that it is particularly difficult to change people’s minds who already have an opinion about a contested issue. Once people have decided that vaccines are potentially harmful, they will process new information about vaccines in a specific way, focusing on content that confirm their existing views, and reflecting anything that opposes what they already believe. This is called cognitive bias and motivated reasoning. It is therefore important to understand why and how these opinions are formed – i.e. the causes of their concerns and scepticism about vaccines. We hope that our research, focused on understanding the nature of anti-vaccine messages on Facebook, will help us to gain new insight into the motivations that drive vaccine hesitancy, and will shed new light on the sources of potentially misleading information that is shared via these groups. Ultimately, such an understanding could provide a basis for constructive engagement with people who are uncertain or hesitant about vaccines. 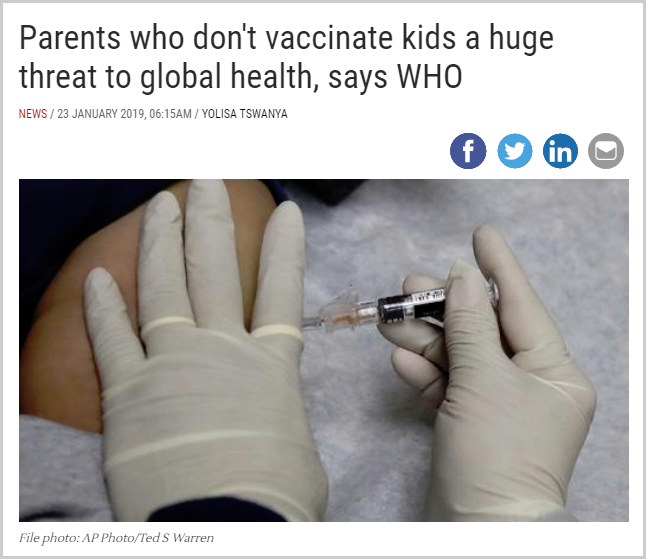 When considering the reasons why some parents avoid vaccinating their children, the WHO points out that there are several contributing factors … We are interested in how new media platforms may be contributing to vaccine hesitancy. Following the allocation of a South African (DST-NRF) Research Chair in Science Communication, Stellenbosch University has become an African hub for research and postgraduate training in this field. The Chair is hosted at the Centre for Research on Evaluation, Science and Technology (CREST). Our research in the field of science communication focuses on the local and regional challenges that characterise the science-society interface, but also looks at global trends in this dynamic field.